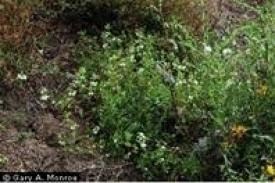 "Saving the Endangered San Diego Thorn-mint"
April 8, 2014 (Alpine)--Join Restoration Ecologist, Scott McMillan, as we begin spring field surveys for populations of the rare and endangered San Diego Thornmint at Wright's Field in Alpine on Saturday April 19 from 19 a.m. to 12 noon. Considered to be the "most endangered plant" in San Diego County, Scott will introduce the group to the thorn-mint plant sites, its habitat and ecology, and discuss BCLT's three-year project to restore and enhance this imperiled member of the mint family. This 1st Saturday event is also an opportunity for those interested in getting involved as volunteers. Opportunities within this project are ongoing, and this is your chance to learn how you can get involved in hands-on restoration of an endangered plant right here in East County. Group parks and meets at Joan MacQueen Middle School - 2001 Tavern Rd in Alpine. Sturdy footwear, water, and sun protection are recommended. Sponsored by Back Country Land Trust. Email: jgreen@bclt.org for more information.